“Due to climate change our region faces hot and dry climatic conditions. It is a challenge for many crops therefore I selected grapes because high temperature is suitable for grape cultivation. 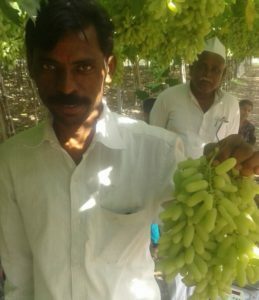 In my village few farmers were growing grapes so I prepared myself well taking assistance from them. All the efforts invested were worth as my farm revenues doubled with grapes,” shares Mr. Santosh Sambhaji Kalane, progressive farmer from Belwandi village, Ahmednagar district, Maharashtra. Mr. Kalane is doing farming on 12 acre farmland, 8 acre self-owned while 4 acre is taken on lease. Sonaka (white, seedless) variety of grape is grown in the farm. Mr. Kalane cultivates different crops in the farm because monocropping has been proved to be risky! 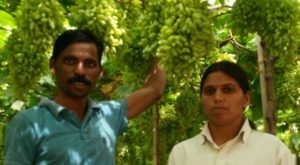 “I am now focused on grape cultivation as it is a new crop while rest of the crops’ cycle and routine operations are standardized. 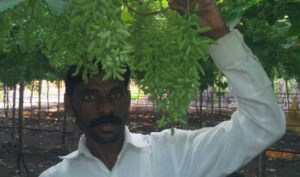 On an experiment basis I grew grapes in 1.5 acre in June 2016. The plants grew well and now I am harvesting the crop. The first production is satisfactory and encouraging. The first batch is already sold and it was profitable,” he states. The berries are firm, evenly spaced along the stalk and well attached to the stalk. Dogridge rootstocks planted in the farm were sourced from nursery in Sholapur at Rs. 6/piece. Along with support of hard wood cuttings the rootstocks are raised on flat beds. “Each wood stick cost Rs. 10/piece. After ploughing the empty land thoroughly we dug the pits of 90 cm x 90 cm x 90 cm dimension keeping row-row distance as eight feet and plant-plant five feet. The pits were filled with desi cow dung and well decomposed bagasse (sugarcane fiber waste left behind after extracting juice). After transplanting the rootstocks it is covered with the soil. We then irrigate the entire plantation with drip system,” he elucidates the process. Rectangular system of planting is adopted for growing grape. azatobacter and PSB required for each plant was 20-25 gram/plant. 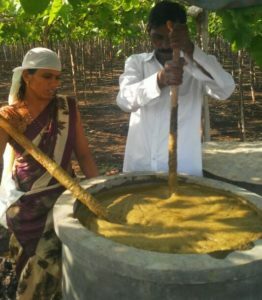 Neem cake used was 1.25 t/ha. Unseasonal rain is the biggest threat to the grapes as it causes diseases and the plants become susceptible to pest attack. “In grapes we have to use little pesticides as the plant is extremely delicate. As I use only bio inputs in the growing stage of the plant it has the resistant and sturdy to withstand the pesticides and doesn’t absorb much. Besides, pesticide is sprayed as preventive measure so quantity used is minimum and less harmful. Yet we ensure to stop all chemical pesticide spray 3-4 months prior to harvesting. These it makes the fruit residue free,” he reveals. Weeding is done manually. Pruning is important for health of the grape vines. “We pruned the canes in September 2017, almost a year later for good flowering and fruiting,” he avers. With these numerous efforts the fruiting was very good. Per plant the yield obtained in 13-14 kg. Once planted the vineyard yields upto 15 years. The production of grapes is expected to increase more than 20 kg/plant after first year harvest then after the plants are required to be changed as fruiting stops after 15 years. If the soil and plants are nurtured well then plants continues to yield till 15 years. As it is first year grape sale for Mr. Kalane he sold the produce to the traders. “We receive many traders from metros. As the produce of my farm was good selling was difficult in terms of selecting the trader because most of them quoted similar prices. We harvested and packed the grapes ourselves. We sold the boxes to the best price offered by Mumbai based trader,” he shares.